U.S. President Donald Trump on Tuesday visited the Pittsburgh synagogue attacked by an anti-Semitic gunman and lit candles for each of the 11 slain worshipers, while thousands protested his presence in the city and victims' families began burying their dead. The presidential trip, which sources said congressional leaders of both parties declined to join, came as Trump drew widespread disapproval for inflammatory rhetoric that critics said may have helped provoke the deadliest attack ever on American Jewry. 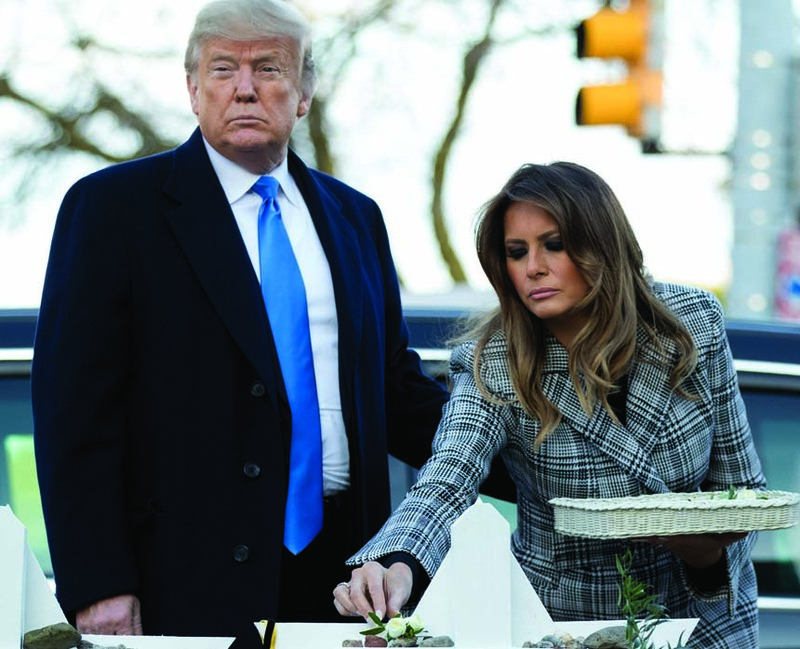 Shrugging off public assertions from Pittsburgh Mayor Bill Peduto that Trump's visit was ill-timed, the president entered the Tree of Life temple where Saturday's shooting rampage occurred, accompanied by first lady Melania Trump. They were greeted by Rabbi Jeffrey Myers, who led them inside the temple to light ritual yahrzeit candles in memory of the victims. Emerging about 18 minutes later, the couple walked to a memorial outside the building, where the first lady placed a flower and the president placed a small stone on a marker for each of the dead. Trump, who according to press secretary Sarah Sanders, described his visit as "very humbling and sad," left in his motorcade after about 30 minutes at the synagogue. He made no public remarks. Several thousand protesters, an ethnically mixed crowd of all ages including members of Pittsburgh's tight-knit Jewish community, held an anti-Trump rally about a block away from the synagogue just as his visit began, singing Old Testament psalms and carrying signs with slogans such as "We build bridges not walls."